The walls are being torn down between PC gamers and Xbox gamers. Phil Spencer showed off DirectX 12 on Windows 10 and announced a new game DVR feature that will be built into the new OS as well. The artificial wall between Xbox players and PC gamers will get torn down with Microsoft's upcoming Windows 10, which allows streaming of Xbox One games to PCs and even lets gamers on the two disparate platforms play together. The announcement was one of several made by Microsoft to show the company's commitment to PC gamers. "We will treat gaming on Windows 10 with as much passion and energy as we have on the Xbox One," said Phil Spencer, the Xbox One division chief Phil Spencer. In addition to streaming games long confined to the Xbox One, Spencer showed off DirectX 12 on Windows 10 and announced a new game DVR feature that will be built into the new OS as well. DirectX 12 has long been expected as part of the new OS, and Spencer showed off how effective the API will be by showing an upcoming Futuremark demo. The demo ran DirectX11 on one side, eventually bogging down to zero frames per second while the DirectX12 demo continued to zip along as more and more objects were added to the screen. The surprising news about DirectX12 though is its apparent power savings. 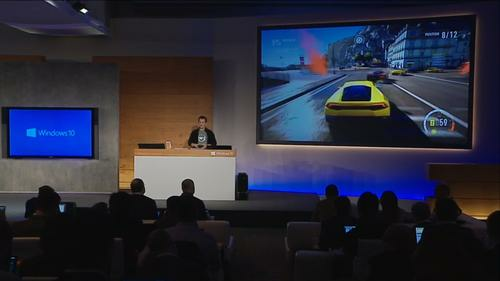 Spencer said a game running on DirectX 12 would cut power consumption in half over DirectX 11. Microsoft said the savings would help tablet and phone gaming, but such drastic power savings should also greatly increase gaming on a laptop if true. Spencer's real surprise is Microsoft's intention to allow PC gamers and Xbox One gamers to play together in some games that support the feature. There have been occasional cross-over capabilities with PC and Xbox players in the past, but they've never ended well. For those who won't play together though, Spencer also announced upcoming support for the streaming of Xbox One games to any Windows 10 PC or tablet. Windows 10's other gaming features will also include a game DVR mode similar to Nvidia's ShadowPlay that allows a player to hit Windows-G and record the last 30 seconds of game play. The game DVR mode is a nod of the head to the increasingly social aspect of gaming. Microsoft said you'll be able to take those 30-second moments of epic gaming and be able to share them using the included Xbox App that will be bundled into Windows 10 devices. The app will let you chat, post achievements, and start Skype calls between gamers.